If paying your insurance premiums by directly visiting the branch has become a problem for you, you can take the online route now. The Life Insurance Corporation of India (LIC) has made a few online options available to its policyholders to pay premiums. You can do so by either visiting the LIC website or by downloading LIC India’s app. To pay premiums through the insurer’s website, visit www.licindia.in and click on ‘Pay Premium online’ from the ‘Online Services portal’. Here you will get two options: a) Pay Direct (Without login) and b) Through customer portal. This is an option for those who do not want to register with the portal. Through this option, you can make three types of payments – a) Premium payment/revival, b) Loan repayment and c) Loan interest repayment. Step 2: A pop-up will appear on your computer screen illustrating the premium payment process, click on ‘proceed’. Step 3: You will be required to enter details such as policy number, instalment premium (excluding taxes) and so on. While entering the details, ensure that you have mentioned it correctly and timely or else session will expire and you will have to start the process all over again. Step 4: Enter the captcha code, and select ‘I Agree’, and click on submit. Step 5: Validate the details mentioned by you in the above step and click on ‘Submit’. If you have more than one LIC policy for which you want to make payments, then you can enter the policy number and premium amount (excluding taxes) to the list by scrolling down. Click on proceed once done. Step 6: The next step will show you the number of policies for which premium is being paid and total premium amount to be paid. Click on ‘Check & Pay’ to make the payments. Step 7: You will have three options to make payment: a) via Internet banking, e-wallets, credit cards, debit cards, American Express Cards, b) Standard Chartered Bank UPI, and c) Axis Pay UPI. Step 8: Choose the option with which you wish to make the payment. If you have already registered yourself with the portal, then you can login to your account to make the payment or else you need to register yourself first. To register yourself, click on ‘Sign up’. You will be required to enter mandatory details such as policy number, premium amount (excluding taxes), date of birth, mobile number and your email address. Once you have registered yourself on the LIC website, log-in to your account to make the payment. Step 1: Log-in to your account by entering your details. Step 2: Once logged in, click on ‘Online Payments’. It will take you to the premium payment portal. 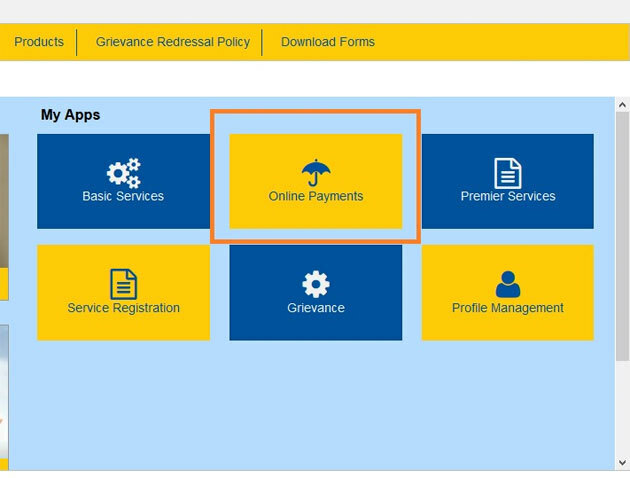 Step 3: Select the policies for which you wish to make payments and click on ‘Check & Pay’. Step 4: The portal will ask you to confirm the details such as mobile number, email id and premium amount once again. Click on ‘Check & Pay’ after confirming the details. Step 5: Choose the payment gateway to complete your transactions. Here is the convenience charges that will levied when you use the ‘Pay Direct’ or ‘Through your account’ options. 1. Provide correct and valid mobile number and email address. 2. The receipt will be mailed to your email address. 3. Online premium payment should be made by the policyholder himself. No third-party payment should be used. 4. If the premium amount is debited from your bank account but error page displayed, a receipt will be sent to your email address in three working days after receiving the confirmation from your bank. You can report such an occurrence to bo_eps1@licindia.com. 5. If Re-trying: First check whether your bank account/card is already debited/charged with the amount of earlier transaction. If debited/charged, do not pay again. Wait for the insurer to mail you the receipt within three days. 6. The online portal will accept the cards issued by the domestic banks. International banks cards will not be accepted. A policyholder also has an option to pay his policy premium by downloading LIC’s app on his phone. There are three apps available on the Google Play Store and Apple’s App Store – LIC Customer, LIC Pay Direct, and My LIC. By using this app, one can make payments either using pay direct option or by registering. The process to make payments is same as that on the website. Apart from making payments, one can also avail other services such as LIC office locator, premium calculator etc. As the name suggests, a policyholder can pay his/her policy premium without registering. One can also download transaction statements using the app. This is an ‘LIC App store’ which provides link to the two apps mentioned above. A policyholder will have to install the above mentioned apps to pay premium via app.